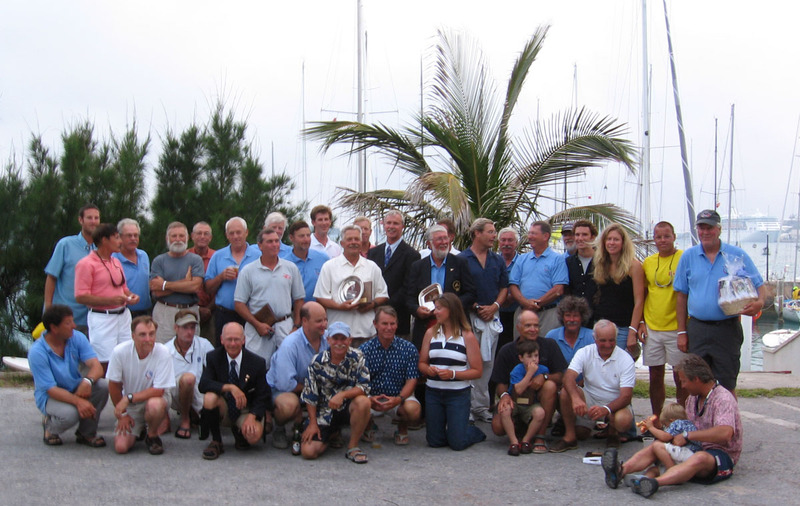 Singlehanded skippers raced from Newport to Bermuda, started Friday, June 9, 2007. The race back from Bermuda to Newport, started Friday, June 22, was doublehanded. Standing Up L to R: Ryan Finn, John Drozdal, Jan Steyn, Doug Campbell, Murray Danforth, Douglas Shearer, Dave Sherman, Brian Guck, Dan Stadtlander, Tristan Mouligne, Don Grey, Barrett Holby, Bjorn Johnson, Peter McCrea, Michael Millard, Dave McLoughlin, Louis Meyer, Jesse Rowse, Lindsay Lowe, Jan Brandt, John Van Slyke. Kneeling L to R: Robert Patenaud, Peter Bourke, Jay Sharkey, Roy Guay (dragged into photo, not a SH skipper), Michael Hennesey, Eric Johnson, Thomas Amory, Kate Ambach, Dimitri Antoniadis, Patrick Nugent, Ray Renaud and Joe Harris. Missing From Photo: Sam Ausmus, Jim Linsley and Rusty Duym.